Wanters post Wants to FyndIt in order to get help searching for their items. Finders look for the Wants online and in stores in hopes of finding a successful match. When a Find is posted to the Want and a Wanter accepts it, a match is made! The Wanter finds out where their item is located and the Finder earns a reward for helping others find stuff. Posted on March 7, 2014 by Mandy	in Action Figures, Match of the Week and tagged Action Figure, Collectibles, Collecting, Collections, Finds, FyndIt, G.I. Joe, Knock-Off, Superhero, Superman, Vintage Toys, Wants. In the early 1990’s, Funskool produced a fully poseable superhero action figure that posed a striking resemblance to the most well-known comic superhero ever, Superman. The action figure was made out of different G.I. Joe parts. Funskool, based in India, had the rights to create G.I. Joe figures, but they did not have the rights to mix and match G.I. Joe parts to create knock-off characters. 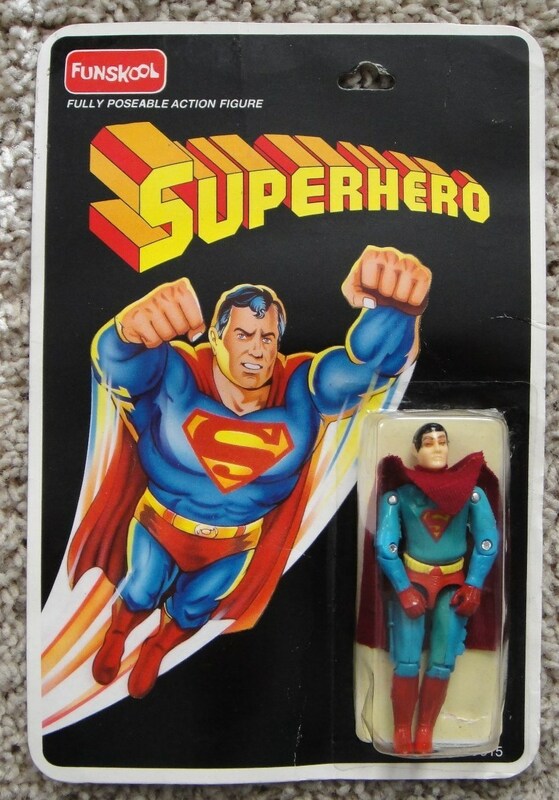 This bootleg Superman action figure is a sought after collectors item and is hard-to-find in good shape. One of our members posted this action figure as a Want on our our website in hopes that someone could help him locate one in good condition for an affordable price. Lucky for our Superman collector friend, a Finder on FyndIt tracked one down in great condition for half the price! Are you looking for a knock-off toy or rare collectible? Post your Want to FyndIt and let our community of Finders locate one for you. Perhaps you know where to find collectibles that others may want? Check out our site to see if you can help others find stuff and earn a little monetary reward for your acts of kindness. Posted on February 14, 2014 by Mandy	in Match of the Week, Toys and tagged Box Set, Collectibles, Collecting, Disney, Disneykins, Finds, FyndIt, Miniatures, Toys, Vintage Toys, Wants. Looking for a hard-to-find item and need help? FyndIt is a new service that helps connect people who want stuff with the people who know where to get it. It is always great to see successful matches on FyndIt. This week’s Match of the Week for February 10th is a vintage 1960’s hand painted Disneykins gift set. There is a lot of Disney memorabilia out there available for purchase, but some items are harder to come by. 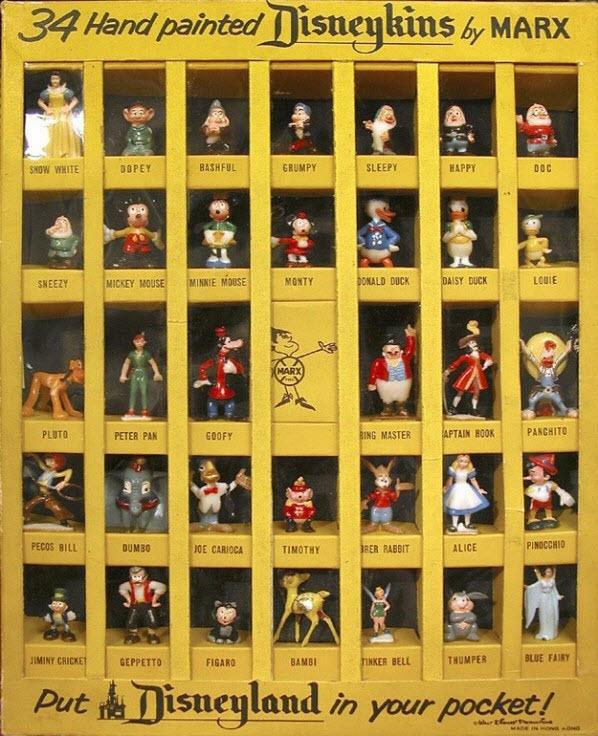 A Disney collector posted a Want to FyndIt requesting help locating a complete box set of Disneykins in good condition for $85-$120. They offered a $4.00 bounty reward to anyone who could help them find their collectible Disney miniatures. The Want was posted in mid-December and a Find was located and posted in the last week. Although it took a few weeks to make a match, the Disney collector was able to get help locating the item for the price they were willing to pay for it. FyndIt can help you track down hard-to-find items, but we can also help you locate readily available items for a better price online or in stores. Looking for something and you want to get a great deal on it? Post it to FyndIt and let our community of Finders help you track it down. Posted on January 23, 2014 by Mandy	in Comic Books, Match of the Week, Statues and tagged Collecting, Collection, Collector, Comic book, Comic Book Statue, Comic Books, Comic Statue, Comics, Find, FyndIt, Good Deals, Rogue, Shopping, statue, Want, X-MEN, XMEN. FyndIt is a great site to turn to when you are looking for something and you just can’t seem to find it at the price you are willing to pay for it. We help connect people who want stuff with people who know where to get it. Sometimes our members help each other find really good deals on comic book memorabilia. 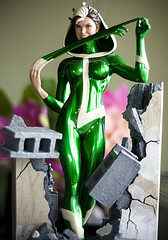 The Match of the Week for January 13th, is Sideshow Exclusive limited edition Rogue statue. A Want for the statue was posted to FyndIt requesting one in good condition with the original box for under $300. A bounty reward of $4 was offered to anyone who could help find it. Someone of FyndIt saw the Want posting for the Rogue statue and knew where to locate it. They responded to the Want with a Find that included a picture, description and price point for the Wanter to review. The person who posted the Want saw that the Finder had located the limited edition statue for $25 cheaper than originally requested. This was a good deal for the Wanter and they accepted the match. Upon accepting the match, the Wanter paid the Finder a bounty reward of $4 for the exchange of the statue’s location. The Wanter was able to walk away happy knowing where to find a good deal on Sideshow statue and the Finder earned a couple of bucks for helping a comic collector out. You can earn money too by helping collectors of comic book memorabilia find items for their collections. Comic book Wants are posted to FyndIt on a daily basis. Cruise the Wants and see if you can make a match. You never know, you might have seen a Want online or in a shop somewhere. Small bounty rewards add up fast. See what you can find at FyndIt. Posted on January 15, 2014 by Mandy	in Comic Books, FyndIt, Match of the Week and tagged Avengers, Captain America, Comic Books, Comics, Find, Find Stuff, FyndIt, Iron Man, Marvel, Marvel Comics, Rogue, Spider-Man, Spider-Woman, The Avengers, Want, Wolverine, X-MEN. The Match of the Week for January 6th, is a copy of The Avengers Annual #10, volume 1. This is a first appearance issue by Rogue. A member on FyndIt posted the Want and specified that they were looking for a CGC fine graded issue of 7.0 or better for a listing price of $20. Our Rogue fan was in luck! A Finder made a match for the exact grade and price requested. Another happy customer on FyndIt! Try your luck and see if you can locate any of the comic book memorabilia Wants posted to FyndIt. If you can locate a Find and make a match, you could earn some spending money. Posted on January 6, 2014 by Mandy	in Comic Books, Match of the Week, Toys and tagged Board Game, Comic book, Find, Found, FyndIt, Game, Games, Gizmo, Gremlins, Horror, Horror Movies, Mogwai, Movies, Stripe, Want, Wanted. The last Match of the Week for 2013, is a 1980’s collectible Gremlins movie board game. Scooter, one of our FyndIt members posted the board game as a Want and offered to pay a small bounty to the person who could help find the item in the condition specified. Luckily for Scooter, one of our members knew where to find Gremlins memorabilia! Scooter is happy because he found his game and the Finder is happy to walk away a few dollars richer by helping someone. Check out other vintage board games wanted by memorabilia collectors on FyndIt. Posted on December 27, 2013 by Mandy	in Action Figures, FyndIt, Match of the Week and tagged Action Figure, Find, Finder, FyndIt, He-Man, Masters of the Universe, MOTU, POP, Princess of Power, She-Ra, Toy, Vintage Toys, Want, Wanter. The Match of the Week for December 23, 2013 is a Netossa Princess of Power action figure. The item was listed by a Masters of the Universe and Princess of Power memorabilia collector. The FyndIt member who tracked it down was able to save the Wanter over $50.00 by finding them a great deal below the specified price range. If you know where to find vintage toys at affordable prices, try your hand at making a match on FyndIt and earn a bounty reward if your item is chosen. Check out the Wants on FyndIt to start earning some extra pocket change. You never know what you might find! Posted on December 21, 2013 by Mandy	in Match of the Week and tagged Advent Calendar, Batman, Board Game, Christmas, Finds, FyndIt, Matches, Robin, Rocky and Bullwinkle, Snidely Whiplash, Wants, Yoda. The FyndIt Finders have been busy this past week, searching for Wants and have made several successful matches. It makes us feel excited when we see Finders helping Wanters track down their items. The Wanters are happy to finally locate their items and the Finders are happy to make a little pocket change helping out other FyndIt members. Everyone wins! Just in time for the holiday countdown, a Star Wars Santa Yoda Jedi Knight Christmas Advent calendar was posted to FyndIt and within the same day one of our Finders located the item and the Wanter happily accepted the match. Another happy customer included FyndIt member Scooter, who accepted a Find for a 1965 classic Batman and Robin board game manufactured by Hasbro. The character depictions were fashioned off of the 1960’s Batman TV series. Someone’s kitchen table is going to have a lot more character with the addition of a vintage Snidely Whiplash salt and pepper shaker. Whiplash was the archenemy of Dudley Do-Right on the animated Rocky and Bullwinkle Show produced in the 1950s and 1960s. He had a habit of tying poor and defenseless Nell Fenwick to railroad tracks. To keep up on all of the latest items Wanted and Found by FyndIt members, check out the Find Archive.